Tots who like to switch things up a bit during playtime will get a kick out of Plan Toys’ Build-A-Robot. This interactive new character comes complete with four emotive, interchangeable heads and features moveable arms and legs. Comprised of eco-friendly, chemical free rubberwood and painted with non-toxic, water based dyes, this cute fella offers youngins a chance to playfully develop their fine motor skills. And we love that it’s really four toys in one, and may perhaps be used to help little ones learn about and express their emotions, which sure puts a smile on our faces! Tots who like to switch things up a bit during playtime will get a kick out of Plan Toys' Build-A-Robot. This interactive new character comes complete with four emotive, interchangeable heads and features moveable arms and legs. 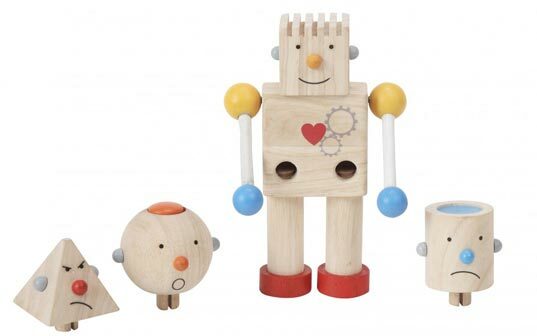 Comprised of eco-friendly, chemical free rubberwood and painted with non-toxic, water based dyes, this cute fella offers youngins a chance to playfully develop their fine motor skills. 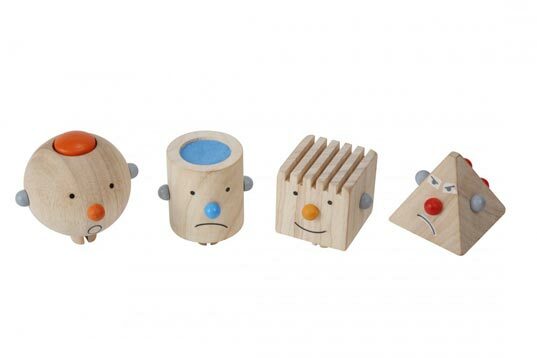 And we love that it's really four toys in one, and may perhaps be used to help little ones learn about and express their emotions, which sure puts a smile on our faces!